With acts juggled over four stages, the festivalgoers at Pemberton were forced to spread out in pursuit of their favourite bands. 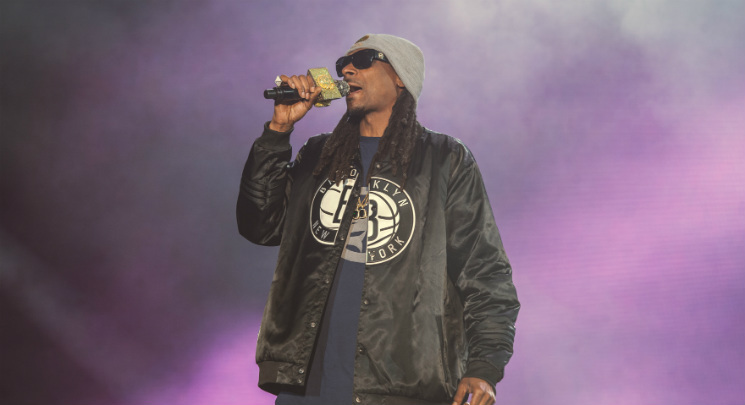 But the stars and scheduled aligned for Snoop Dogg Thursday night (July 14), when he was the only performer onstage at 10 p.m. The Largest Crowd-Drawer award clearly went to the Doggfather, who rolled out his G-funk classics for a mob deeper than a football field and wider than two of them. Decked out in a black Brooklyn Nets button coat, grey toque and dark sunglasses — a costume that masked his 44 years on this funky planet — Snoop D-O-Double-G strolled through early-catalogue gems that he can recite in his sleep: "Nothin' But a G Thang," "Who Am I," "Deep Cover," "Tha Shiznit." Singles like "Beautiful," "Drop It Like It's Hot," "Young, Wild & Free" and "Sexual Eruption" gave the set a greatest-hits feel, but you feel like "Legend," from Snoop's just-released Coolaid LP, will ironically not be adding to his lore. Bouncing to House of Pain's "Jump Around" felt unnecessary when the lanky MC from Long Beach has so much of his own worthy material, but the inclusion of 50 Cent's "P.I.M.P." remix was well-chosen. One creative fan held aloft a tree branch affixed with an illuminated sign that read on one side "Lodi Dodi" and on the flip "We Likes to Party" — and Snoop obliged the request with his fantastic Slick Rick cover. Snoop may be getting a little sleepier with age, but his '90s work still holds up lovely. To wit: thousands of people rocking out to "Gin and Juice" in a farmer's field.